I just received the awesome image of Kanga, the first WallyAce 26 m unit of the innovative displacement line from Floating Life. With this brand new boat Wally confirms its vocation: providing to the owner and guests huge volumes, high comfort level, more stability together with super reduced fuel consumption, noise and vibrations, for those who love a comfortable long time cruising. This yacht shows the indisputable Wally’s signs of improved functions combined with contemporary and clean style, standing out in the displacement category. Her hull lines are classic yet contemporary reflecting the unmistakable Wally style. engine room and tender garage located amidships to concentrate the weights in the centre of gravity and provide a smoother wave riding. the 95-sqm guest and service deck in the lower level. 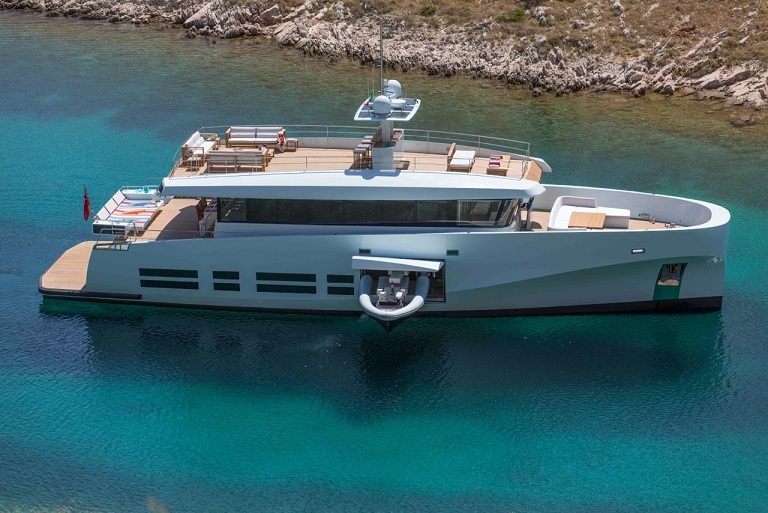 The WallyAce 26m Kanga features over 50 sqm of social area incorporated in the glass walled superstructure, that includes the lounge with large sofas, the dining table for 10-12 guests, the steering and navigation station. The accommodation layout reflects the perfect configuration for large families and charter capabilities: two large double cabins and two twin cabins, sleeping up to10 people (two cabins have additional pullman beds). All cabins have en-suites. The double cabins are aft opening onto the Terrace-on-the-sea® with direct access to the water. The crew and service area is forward, separated from the guests night area by the engine room and the garage, providing maximum privacy. The crew accommodation is for four people sleeping in two double cabins. The interior styling is simple and fresh, with teak wood joinery and beige coloured fabric. Essentially, WallyAce 26m is a semi-custom line built using the sandwich GRP construction technology. The hull skins are 50 % thicker than those required by the Classification Register, offering up to three times the mandatory solidity and toughness, to provide a true round-the-world cruiser…. another superb piece from Floating Life Holding which is a Swiss company, specialized in the management, charter and sales of super- and mega-yachts.